If you’ve never heard of the term “Decision Tree UX”, don’t worry, you’re not alone. In fact, no one has ever heard of it, because I made it up! While the term is new, the concept is not, and something most of you might already be familiar with. Decision Tree UX refers to the flow through a series of decisions and their possible consequences to achieve a single, broader goal. But since were talking about apps here, let’s convert this tree into a prototype. Tada 🎉 We have “Decision Tree UX”! 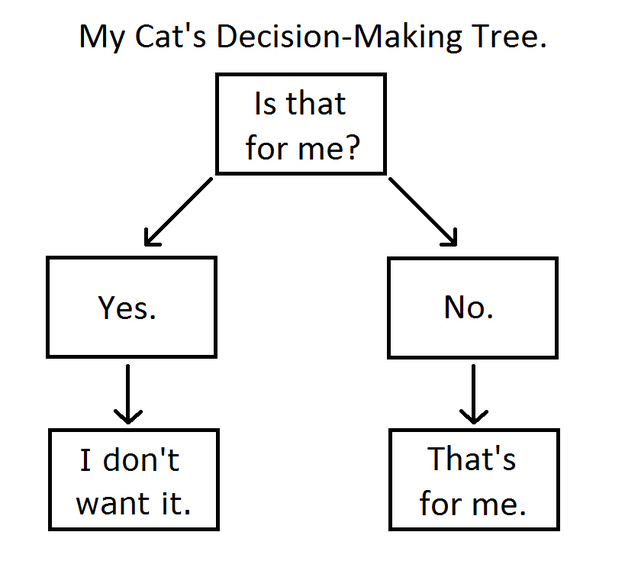 While there are several different screens, they are all related to the same “goal” or “state” of a cat’s single decision. I don’t have a great answer to this question, other than to say, when I was recently presented with the challenge of having to code a Decision Tree UX, I was overwhelmed with the options for how to build it and sometimes having too many options makes things hard. Option: Passing around the single model object from Activity to Activity via Intents. Why I Said “No Way Jose”: For my app the model object was fairly large and passing it via an Intent wasn’t really an option. Also, passing around an object doesn’t allow for a higher level understanding of what is happening. Option: Inserting some data store into each Activity so they might access the same object and pass the particular models’ id via Intents. Why I said “No Way Jose”: This was my runner up. What I didn’t totally love about this option was how many switch statements I was going to have to put into each Activity. Depending on where the user was coming from, there were several options for where to send them next, and I was going to have to put a lot of, what I will call, “higher level logic” about the broader flow in each individual Activity. As I thought about these requirements and how to solve for them, I realized I was really describing a parent / child relationship - where the parent held the state and acted like a puppeteer moving its children around. That thinking led me to choose Fragments as my means for implementation, because the relationship between Activitys and Fragments can mimic that of a parent / child. Now that we understand the requirements and the things were trying to avoid, let’s start coding. Using the above cat decision app as an example, let’s begin with the Fragments. The above app has four distinct screens, so let’s make four Fragments. Now we know the parent Activity, let’s call it DecisionActivity, will initially begin by attaching StartFragment but what happens when a user taps the start button, and how can we test that? The answer? Interfaces! Let’s give StartFragment an interface, called StartDelegate, to call whenever the start button is clicked. But who will listen for that callback? The DecisionActivity is not a great candidate since unit testing with Activitys is not always easy, so let’s make a class to manage all the coordination logic that we can more easily mock and test. Say hello 👋toDecisionCoordinator. You might notice that we are not actually showing any Fragments yet, and there are two reasons for that. First, we are not “in” an Activity we don’t have access to a FragmentManager which can show a Fragment. Second, we want to be able to test everything remember? So we want a solution that will allow us to test that the correct Fragments are being shown at the right times. Say hello 👋 to FragmentRouter. Here’s what happens when we inject FragmentRouter into the DecisionCoordinator.